Authors of the Philosophy of Education Society of Great Britain’s new pamphlet, How to regulate faith schools, also argued that pupils should not be directed towards belief in any particular religious faith. They recommend an end to compulsory collective worship in schools and moves towards more inclusive admissions arrangements and religious education in all schools. The pamphlet was authored by Matthew Clayton, Andrew Mason, Adam Swift, and Ruth Wareham. ‘The UK is the only country in the world to mandate Christian worship in state-funded schools, which means children are expected to take part in compulsory collective worship such as saying prayers and singing hymns as part of their day-to-day experience at school. ‘The current law, which forces young children to partake in religious acts of worship unless their parents opt them out, is morally wrong and ignores the rights of children to have a rounded and broad education free from direct religious influence. 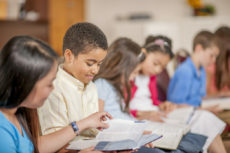 ‘Instead, the school system should be fostering a culture where students are encouraged to make decisions for themselves about want they want to participate in and this should be done through inclusive assemblies which offer spiritual, moral, social, and cultural development that is equally inclusive of all students. ‘We welcome calls by this coalition of leading academics to end collective worship in schools and we also are calling for faith schools to be abolished in the UK. ‘If we are to move to a more united and less segregated future, we need a genuinely inclusive school system where all pupils, regardless of their backgrounds and beliefs, are educated together and not separately according to the religious character of the school.